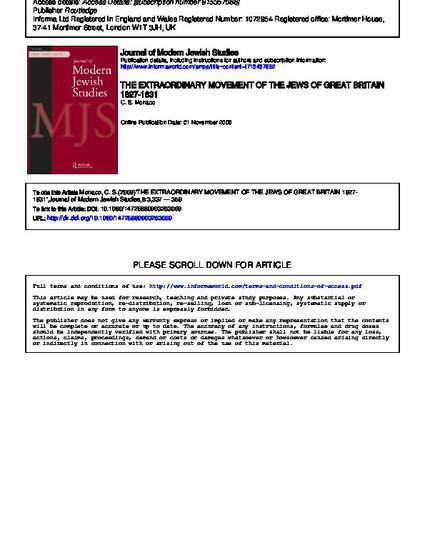 This article identifies a previously ignored social movement that existed in London during 1827–1831. The Jewish rights movement, as it will be called here, actually involved a coalition of Jews and Christians. During the movement’s initial phase, London Jews, led by Moses E. Levy (an activist from the United States), joined in solidarity with their oppressed brethren in Russia: their public protests against tsarist policies drew a broad response from the national and international press. This unparalleled movement influenced national political agendas and major legislative reforms, and resulted in striking changes within the Anglo-Jewish community. By utilising the modern social movement framework as an essential tool to reconstruct this long-forgotten collective effort, the Jewish rights movement has emerged as a notable chapter in the development of modern Jewish political identity.